Unless the current Mexican president, Enrique Peña Nieto, had a change of heart last night—maybe his soul was stirred by Donald Jr.’s touching email confession—he’s not going to pay for Trump’s border wall. Maybe we could ask Mexico’s former president? Ah. Well, never mind then. Still the money for a massive, useless wall in the desert has to come from somewhere. Cutting costs by hiring cheap illegal immigrants to build the thing seems like a bad PR move, though, right, Trump? 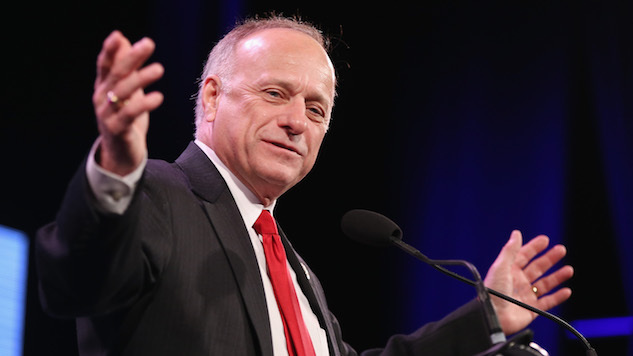 Thankfully, Rep. Steve King (R-Iowa) has a solution. Yesterday, the House Appropriations Committee introduced a spending bill that would allocate $1.6 billion toward building the wall. But King (correctly), recognizes this won’t be enough. So today King suggested to the Washington Examiner that we take around $500 million from Planned Parenthood, and another $4.5 billion from food stamps. The hope being that building the wall would create several new jobs and create less of a need for welfare programs. Now we have a problem of obesity. And when you match up the [Electronics Benefits Transfer] card with what the scales say on some of the folks, I think it’s worth looking at. [Former first lady] Michelle Obama looked at it, Republicans should be able to look at it too. Look at that. We just solved the the illegal immigrant “crisis”, created a bunch of new jobs and finally got rid of those pesky, poor fat people. Somebody is finally taking that “make America great” slogan to heart.